In the '60s it was called the "back to the land" movement, and in Helen and Scott Nearings' day, it was "living the good life." Whatever the term, North Americans have always yearned for a simpler way. But how do you accomplish that today? Blending inspiration with practical how-to's, Rural Renaissance captures the American dream of country living for contemporary times. Journey with the authors and experience their lessons, laughter and love for the land as they trade the urban concrete maze for a small organic farm and bed and breakfast, Inn Serendipity, in Wisconsin. Rural living today is a lot more than farming. It's about a creative, nature-based and more self-sufficient lifestyle that combines a love of squash, solar energy, skinny dipping and serendipity. wildlife conservation and land stewardship. An authentic tale of a couple whose pioneering spirit and connection to the land reaches out to both the local and global community, Rural Renaissance will appeal to a wide range of Cultural Creatives, free agents, conservation entrepreneurs and both arm-chair and real life homesteaders, regardless of where they live. Kivirist and Ivanko are innkeepers, organic growers, copartners in a marketing consulting company and have previously published books. John is also an award-winning photographer, contributing to national and international publications including Mother Earth News, Wisconsin Trails, Urban Farm, E Magazine, Hobby Farms, Islands, Parade and Scottish Life. Former advertising agency fast-trackers, they are nationally recognized for their contemporary approach to homesteading, conservation and more sustainable living. They share their farm with their son, a 10 kW wind turbine and millions of ladybugs. For more information about Inn Serendipity, visit www.innserendipity.com. Follow Rural Renaissance on Facebook, and share your story. 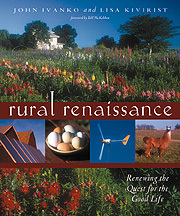 Order your copy of RURAL RENAISSANCE from Inn Serendipity (a PDF file order form) or purchase online via SquareUp.